Well, this is unexpected. 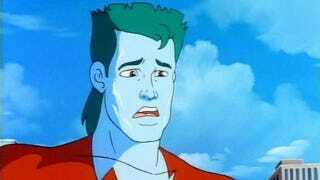 Even Captain Planet is baffled. The Journal of Industrial Ecology (via Science Magazine) brings word that—in many cases—downloading video games actually harms the environment more than buying them on the ruthlessly manufactured ecological death frisbees we call discs. Crazy, right? Yeah, I'm skeptical too. According to the researchers, the energy intensity of the Internet is the main culprit, followed (rather distantly) by consoles' energy usage. Between download time and gameplay, consoles (or at least the PlayStation 3, which was used in the study) are responsible for more carbon emissions than the whole game disc production/delivery process—from factory to store to your living room. "For an average 8.80-GB game, carbon emissions varied depending on whether the game was downloaded (21.9 to 27.5 kg CO2-eq) or distributed on a BD disc game (20.8 kg CO2-eq). Gameplay accounted for the largest share of carbon emissions (19.5 kg CO2-eq) [and was equal regardless of distribution method]." "Overall, the results indicate that the hypothesis—that downloading data will be more carbon efficient than distribution by disk—is not likely to have been correct in the case for PS3 console games sold within the EU since 2010 (except for games downloaded of less than 1.3 GB). Similar results can be expected for larger-than-average files in the United States, although by a smaller margin because carbon impacts of production and distribution of optical discs are estimated to be almost 3 times more than in the case of PS3 BDs within the EU." That last part, especially, is interesting. Downloading is only significantly worse for the environment in EU territories. In the United States disc production makes an ecological footprint that's three times bigger, reducing the gap between the two by leaps and bounds. Thing is, this study's results are extremely, er, subject to change based on various conditions. For instance, if you drive all on your own to a store with the sole purpose of purchasing a single game, then total emissions for Blu-ray discs go way up, nearly matching downloading's upper limits. "To put this in context," the researchers wrote, "games of 5.40 to 19 GB purchased as the sole item during a shopping trip would have carbon emissions in the same range as that for a download (i.e., too close to call)." Their approach to figuring out exactly how much energy the Internet's inefficiency accounts for is also rooted in a lot of estimations, so it's hardly rock solid. Different countries handle Internet energy usage differently as well. "Reducing the energy intensity of the Internet by half had a proportionate impact on carbon emissions of download. Although Weber and colleagues 2010 estimate that Internet energy efficiency is likely to double every 2 years, the historical rate of change may not continue." "In addition, the capacity of BD discs has quadrupled between 2006 and 2013 (a doubling time of 3.5 years), allowing for larger game sizes, for example, new PS4 titles average 16 GB (Eurogamer 2013). Production efficiency of disc production is also expected to have improved by approximately 5% to 10% percent per year (Sony DADC 2010). Because of the uncertainty in these parameters, the future relationship between the carbon emissions of downloading games and that for producing and distributing BDs is difficult to predict with certainty." So basically, there is probably some validity in this research, but it's super conditional. To be truly comprehensive we'd need similar experiments run a) this year, b) in a bunch of other locations, and c) under different conditions (e.g. driving vs walking to the store, different console settings, different consoles, etc). As is, this is interesting, but I mainly hope it encourages people to dig deeper into the topic, to emerge from its loamy depths and spurt dirt like some kind of underground cave-dwelling whale. Or, you know, a simile that actually makes sense. You can read through the full paper for free here. Find anything else particularly noteworthy?